Elegantly and easily connect you external watercooling components to your internal components without having to compromise flow or cooling performance. The Panama HF38 allows the use of G3/8" inner threads and a features a special inner geometry which sustains the full inner diameter which is usually not possible. This slot cover is extremely flexible and truly upgrades your case and cooling system! The Panama HF38 consists of three components and can be installed tool-free. Simply fixate the slot cover like and other. The inner part is then connected to the outer part and screwed together. They seal safely with two O-ring seals. Use G3/8" fittings of your choice. The neighboring slots are not obstructed by this slot cover! We recommend using the lowest free slot for easy tubing management. 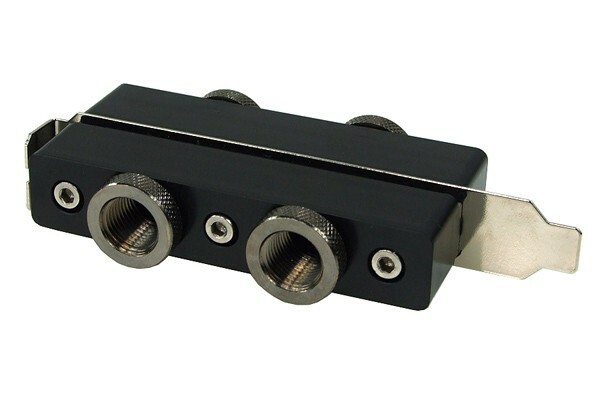 Should you not be using 3/8" connectors, low-profile adaptor pieces are included to allow use of this slot cover with G1/4" fittings. Maximum inner diameter: 18mm without congestions! Ist absehbar, ob und wann dieser Artikel wieder verfügbar sein wird? Die Slotblende wird voraussichtlich bis zur nächsten Woche wieder verfügbar sein. Ich bräuchte Ersatzdichtungen (O-Ring) von den 3/8 auf 1/4 Zoll Adaptern. Habt Ihr diese im Sortiment? Nein, wir haben dazu keinen passenden O-Ring. Wenden sie sich bitte direkt an Alphacool, eventuell können die ihnen zumindest genau sagen was für ein O-Ring sie benötigen oder gleich einen Ersatz zuschicken. TOP! Habe ich verbaut und super Lösung. Damit endlich eine gute Durchführung ohne Bremse. Einziger Vorschlag. Dreht Gewinde und Schrauben, damit man das von außen festschrauben kann. So muss man im Case Schrauben. Aber kein Problem, weil wenn 1y drin drin.